How many miles will you drive or fly for Thanksgiving parties? That’s Wednesday night through Sunday night and includes any miles where you will be driving to Thanksgiving parties. 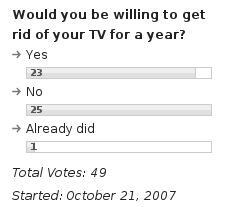 I was kind of surprised to see so many people say they would be willing to get rid of their TV for a year but so few that already did. My response was no. I don’t watch a ton of TV and most of what I watch could easily be purchased as end of season DVDs and watched on my computer. But, I do like to watch the occasional Hawkeye basketball and football games and there really isn’t a good way to do that online. Plus, on the days where work is rougher than usual and the kids are ornerier than usual, it is nice to watch a few mindless sitcoms now and then.